Samia is a horse completely out of the ordinary working incredibly easy and uncomplicated under saddle. She has three good gaits and the canter is second to none. She is a very beautiful horse with a great charisma. Samia is a big girl who, despite her height is very well behaved and easy to handle. 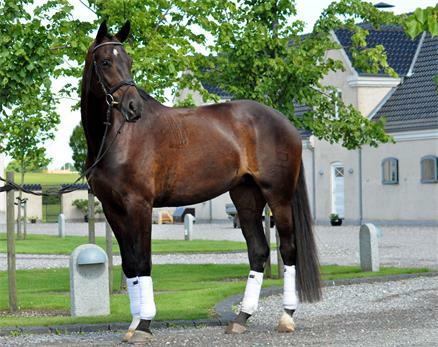 In 2011 qualified Samia at both 4 years Championship Finals in Odense (Den) and Young Horse Championships 2012 at Danish Warmblood (DV) stallion licensing in Herning (Den) with Grand prix rider Michael Søgaard and placed 7th with 880 points. Amongst other, test rider Jan Brink (Swedish team rider) gave Samia 2 x 9.0 points! Michael Søgaard, did the impressive job of educating and developing this great horse. Immediately after Herning, Samia traveled to Norway, where JJ Horses (Karen Helene Gjerde) educated her further, see video below. – A mare that is somehow too tall, however as she is five years old, we have chosen to grade her to the main studbook, because we believe she would have met the height criteria as 3-year-old. It is an amazing mare, so stunning. It is a long legged horse with a big frame, feminine and suitably noble. She has an elegant head, a befittingly long and high set neck, long, sloping shoulder, long and well-defined withers, and there is no doubt, where the saddle fits. She has a good, smooth top-line, a long, shapely, and muscular croup and good thigh muscles. Straight front legs and a tad turned in toes, but well-shaped hooves. Supple and spacious movements that are delicious and smooth. The movement through the back, trot and canter is something you dream about seeing on a horse. She has balance without comparison and good elbow freedom. We have awarded the walk 8 and the trot and canter respectively 9. Copyright 2014 - Malo Stables | All Rights Reserved.